Top seed Serena Williams came from a set down to book her place in the Stanford Classic semi-finals with a hard-earned 2-6, 6-3, 7-5 win against fifth-seeded Serb Ana Ivanovic on Friday. Serena, whose sister Venus was beaten in three sets by Germany's Andrea Petkovic earlier in the day, initially struggled on a fast playing surface but gradually found her range to seal victory in just under two hours. 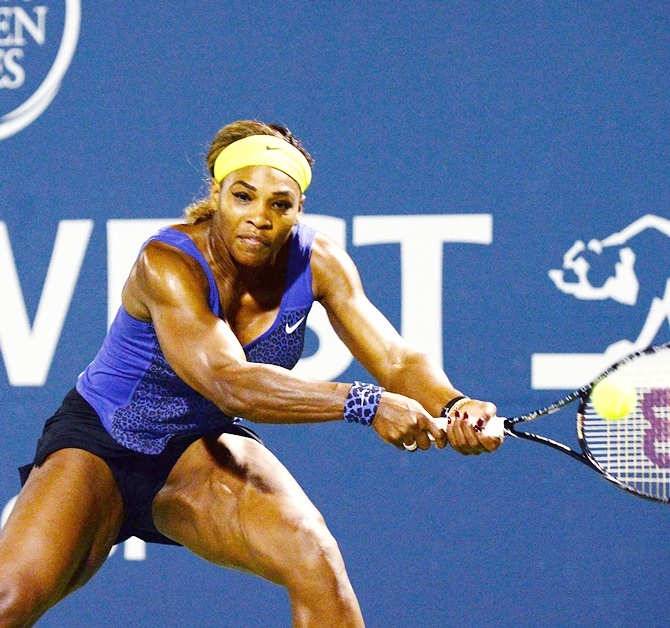 "It wasn't very easy," Serena, who will face Petkovic in the last four on Saturday, told ESPN. "Ana plays very well. This surface was a little fast so she was hitting a lot of shots. "But I just fought it and stayed in there. I just tried to do everything that I worked on." Earlier, the eighth-seeded Petkovic battled past Venus Williams 6-1, 3-6, 7-5 in a pulsating match lasting nearly two hours. In the other two quarter-finals, third-seeded German Angelique Kerber swept aside Spaniard Garbine Muguruza Blanco 6-2, 6-1 while Varvara Lepchenko crushed fellow American Sachia Vickery 6-1, 6-0. 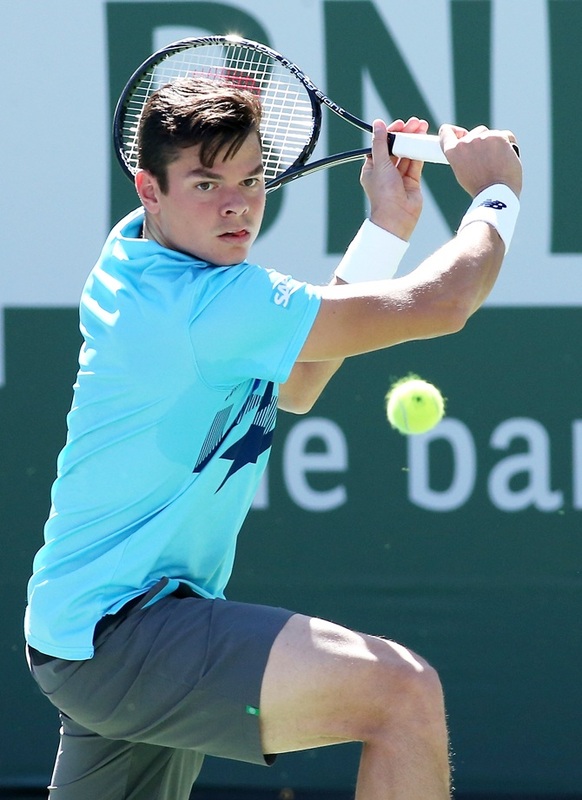 Second seed Milos Raonic relied on his powerful serve to blast his way through his quarter-final match against American Steve Johnson at the Citi Open in Washington on Friday. Wimbledon semi-finalist Raonic took a while to get going but was unstoppable once he found top gear, pounding down 16 aces to beat the unseeded Johnson 7-6(2), 6-2. The Canadian will meet another unseeded American, Donald Young, in a Saturday semi-final after Young upset seventh-seeded South African Kevin Anderson 3-6, 7-6(3), 6-2. The other semi-final on the hardcourt at the William H.G. Fitzgerald Tennis Center will pit sixth seed Richard Gasquet of France against either Colombia's Santiago Giraldo or Canadian Vasek Pospisil. Gasquet had the easiest quarter-final match on Friday, waltzing past Japan's Kei Nishikori 6-1, 6-4 in less than an hour. In the women's semi-finals, second seed Ekaterina Makarova will meet sixth seed Svetlana Kuznetsova in an all-Russian encounter while New Zealand's Marina Erakovic will face Japan's Kurumi Nara. 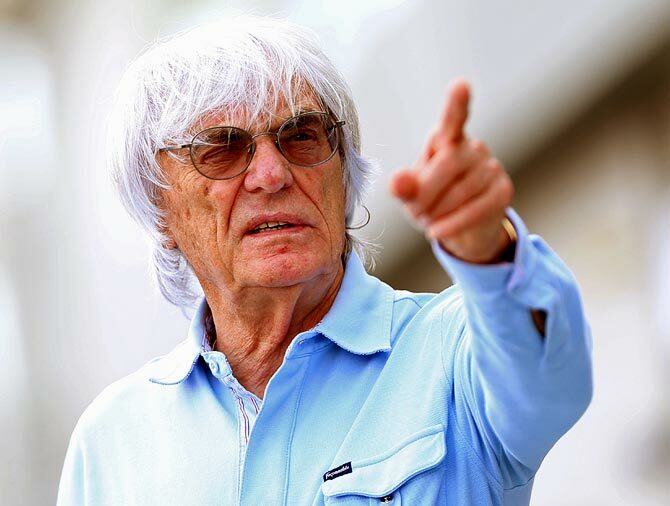 A bribery trial against Formula One boss Bernie Ecclestone that has been threatening his hold over the motor sport may end early with a settlement, a Munich court spokeswoman said on Friday, after Ecclestone's lawyers held talks with prosecutors. Munich newspaper Sueddeutsche Zeitung will report in its Saturday edition that the billionaire Ecclestone personally had negotiated a $100 million settlement with the state prosecutor on Friday. Ecclestone's lawyer declined to comment on the amount. The state prosecutor also declined to comment on the report. Ecclestone, 83, went on trial in Munich in April over allegations he bribed a former German banker as part of the sale of a major stake in the motor sport business eight years ago. Ecclestone's lawyers held talks with prosecutors on Tuesday. The Sueddeutsche Zeitung reported on Saturday that prosecutors had demanded 100 million euros but that was too high for Ecclestone. He negotiated himself with the prosecutor and agreed to a $100 million (74.5 million euros) settlement. The newspaper said the state prosecutor would still be able to tout the $100 million figure. Lawyers for Ecclestone, who denies wrongdoing, said they had offered to pay German state-owned bank BayernLB 25 million euros ($33.5 million) to help settle the case. If convicted the British magnate could face up to 10 years in jail and would have to cede control of a business he has built up over the past four decades. Manchester United's squad have been warned. 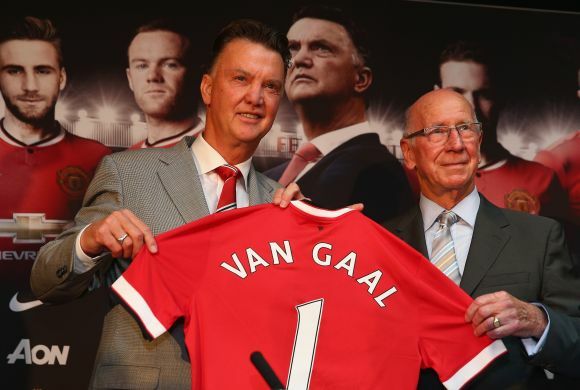 Slack off in training and new manager Louis van Gaal will be watching you. The 62-year-old Dutchman is leaving nothing to chance as he prepares in painstaking detail for the start of the Premier League season, introducing a range of new innovations. High-definition cameras have been installed at the club's Carrington training facility, meaning every kick can be monitored by the former Bayern Munich and Barcelona coach charged with restoring the 20-times English champions back to the top after a woeful seventh-placed finish last season. The no-nonsense coach has also insisted on players speaking English at all times during training and has even replaced rectangular tables in the canteen with round ones to encourage conversation amongst his players. New pitches, to replicate the Old Trafford surface, have been put down at Carrington and Van Gaal has prioritised making the squad fitter than it was under former manager David Moyes who was sacked less than a season after taking over from Alex Ferguson. "I think it is a lot more detailed at the training ground (now)," United defender Evans told a news conference in Michigan where United will play European champions Real Madrid in front of an expected 100,000 fans on Saturday. "They have spent thousands on it and a few of the lads have seen HD cameras around the pitch. "We have this system at the minute where he can watch us on the pitch. "I think a lot of teams use it but we are looking into it in quite a lot of detail," Evans added. "He is saying 'you should be five yards to the right', we are able to see things that are happening live on the pitch. "That kind of scrutiny is new to every single player. "The case before was that as long as we got the results everything was fine." Luis Suarez's appeal against a four-month ban for biting will be heard at the Swiss-based Court of Arbitration for Sport (CAS) on August 8, a spokesman for his new club Barcelona said on Friday. 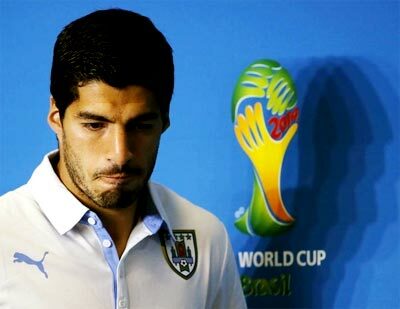 Suarez was handed the suspension, and a nine-match international ban by football's governing body FIFA, after he bit Italy defender Giorgio Chiellini at the World Cup in Brazil in June. Barca have since bought the Uruguay striker from Liverpool and the 27-year-old is due to return to action at the end of October. He could make his debut in the 'Clasico' against Real Madrid on the weekend of October 25-26 depending on the outcome of his appeal. According to media reports, CAS has agreed to fast-track its verdict and it could be known by mid-August. Real Madrid forward Cristiano Ronaldo has been ruled out of Saturday's friendly in Michigan against his former club Manchester United but the La Liga side are hoping he will be fit for the European Super Cup. The Portugal captain and World Player of the Year has been hampered by a left knee problem in recent months and was clearly below his best at the World Cup in Brazil, where the Portuguese failed to progress beyond the group stage. "Cristiano Ronaldo is doing individual work and the plan is continue with the programme and on August 5 he will train with the team again," Carlo Ancelotti, the coach of the European champions, told a news conference previewing the match at the University of Michigan stadium. Ancelotti added that he was counting on Ronaldo recovering in time for the European Super Cup against Real's La Liga rivals and Europa League winners Sevilla in Cardiff on August 12. The game against United is part of the International Champions Cup friendly tournament. Real lost their opening two Group A matches against Serie A sides Inter Milan and AS Roma respectively and Ancelotti said he and the players were determined to put on a good show despite already being eliminated. The first leg of the Spanish Super Cup against city rivals Atletico Madrid is at Real's Bernabeu stadium on August 19 and the return is at the Calderon on August 22. The elder brother of South African Olympic and Paralympic track star Oscar Pistorius has been badly injured in a head-on collision but his life is not in danger, a family spokeswoman said on Saturday. The accident happened on Friday night north of the capital Pretoria when Carl Pistorius, 29, whose brother Oscar is on trial for the murder of his girlfriend, was returning home from a business trip. "We can confirm that Carl was involved in a serious car accident last night. Carl was badly hurt but we are thankful that he is out of danger. He was transferred to a hospital in Pretoria," spokeswoman Anneliese Burgess said in a statement. Carl Pistorius was acquitted last year on charges of culpable homicide or manslaughter over the death of a woman in a traffic incident in 2008. Pistorius was travelling on Friday with a companion but Burgess did not say whether he was driving or whether anyone else had been hurt in the accident. 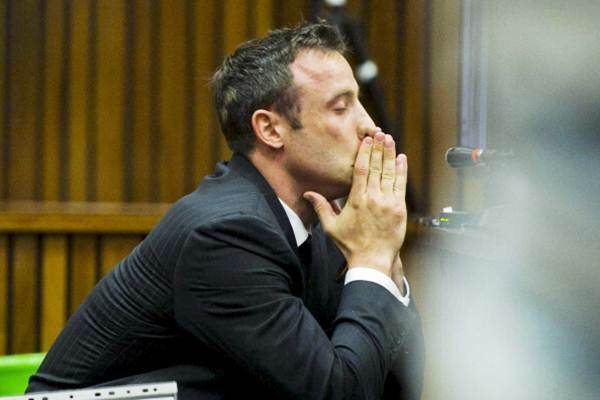 Oscar Pistorius, 27, known as ‘Blade Runner’ because of the carbon-fibre prosthetic running legs he uses, is on trial for the murder of his girlfriend, Reeva Steenkamp, whom he shot and killed at his luxury Pretoria home on Valentine's Day last year. CWG PHOTOS: Female athlete lifts Sushil Kumar! CWG PHOTOS: Glamorous athlete of the Day!